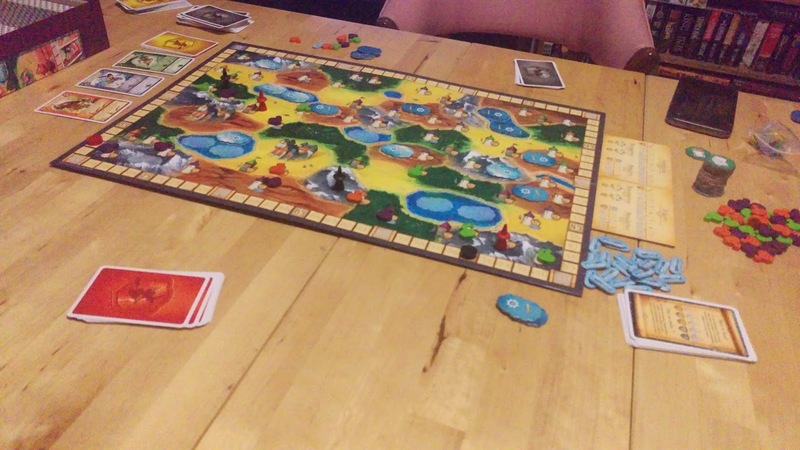 Last night we had a board game night. 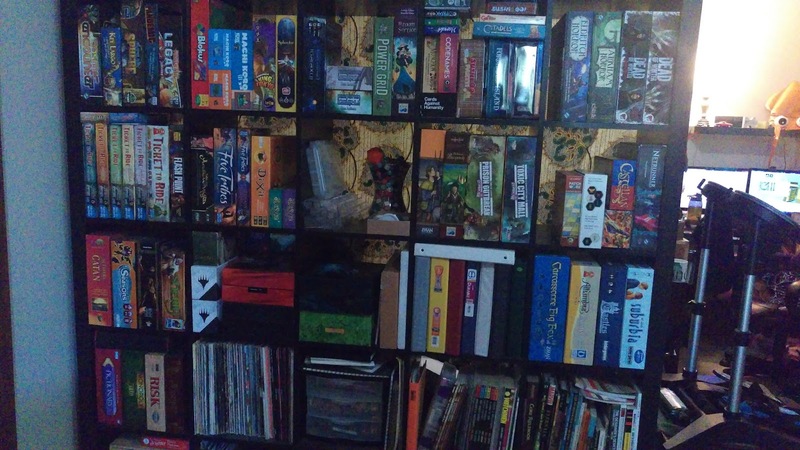 My roommate and I are both avid collectors of board games, and have extensive wishlists. Whenever a big sale comes up, I generally crunch numbers against my CamelCamelCamel.com report and if it comes to equal or lower than the lowest amazon price in history, I will buy. I also get CamelCamelCamel alerts whenever an item on my list drops below the lowest historic price. I have given myself a pass to buy any game on my list if it drops to a historic low. (this works for my budgets, but usually 5 or six will drop over the same weekend.) The down side of this is that I don't have time to play them all as soon as I get them, so they start accumulating. Anyway, the short of it is that the two of us have limited time between my full time job, Australian schedule and two time-draining hobbies, and his schooling. The stack of unplayed games is growing. 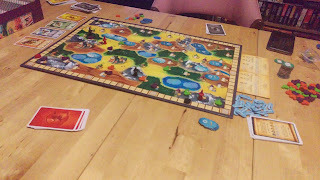 We finally had a 3-day weekend to catch up and play through some of the unplayed games. We got 4 down and still have many left - most of the games left are heavy, thematic games, that take 90 minutes just to read through the instructions. 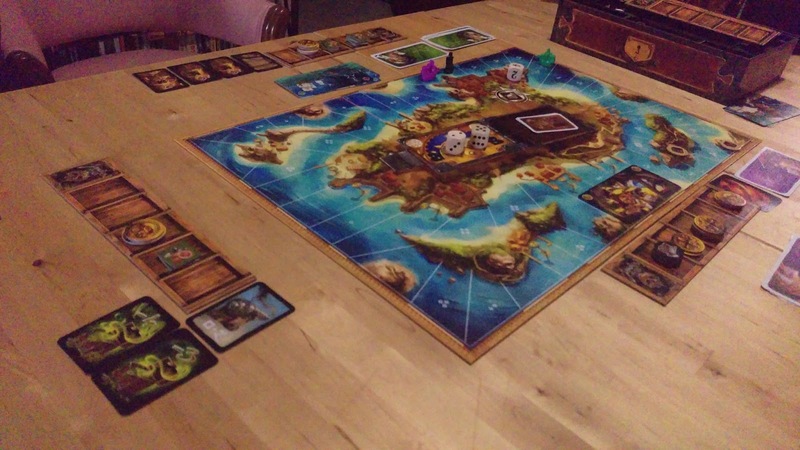 Games we played include his copy of Jamaica , a pirate themed racing game. You have a hand of three cards that have two actions. The rotating roll of Captain is in charge for the round - in charge of rolling two dice and arranging the results into Day and Night. You then choose one of your cards and play it - using the two dice to tell you how to complete each action. You can store things in your hull, but only 5 sections. You use the items to pay for the spaces you land on. In two player mode we had to fight with a Ghost Ship, which balances out heavy leads. The Captain for each round takes turn controlling the ghost ship. We both enjoyed it, there wasn't a ton of direct combat in our game, but there is definitely a place for PvP or even PvE with the ghost ship. I enjoyed it and would play again. I am pretty sure he liked it as well, as he stated he would more than likely be keeping it when he moves cross country next month. Just in personal preference of game play, I'd say a 7/10 not mind blowing, but decent. I liked the art and the figurines, the chits, the insert for the game itself was really good. You play the part of a witch, using your connections to move between territories and deliver magic potions. Each territory is a terrain type like Hill, Mountain, Plains, Forest. You have a hand of 10 friend cards. These friends allow you to move to another terrain type(witches), deliver potions in that terrain type(Druids), or gather resources to create potions(gatherer). All players simultaneously choose 4 friends and play them face down. The first player reveals the first friend they chose and declare if they will be Brave or Cowardly. The trickiest mechanic is that each friend has a Brave action and a Cowardly action.. The Brave action lets you do more/have higher benefits, but only one person can use the Brave action of a character. The Cowardly action is a bit more limited, but everyone who played that friend can use the cowardly action. Where it gets complicated is at this point - If I am first player and I reveal my Hill Witch, the brave action is that I can move to an adjacent hill and deliver a potion to a tower. The cowardly action is that I can move to the adjacent hill. I choose to be a Cowardly Hill Witch. I move to the adjacent hill. Nameless Roommate #1 also chooses Cowardly Hill Witch, and since I revealed mine, he reveals his before the next friend is revealed. we each take our action. No big deal. However if I choose to be a Brave Hill Witch, before I can take my action, if he has chosen Hill Witch, he must reveal that He is also a Brave Hill Witch, and takes my chance to use the ability at all. So it's a game of trying to predict where your opponent is going next and taking a chance that they aren't going to the same area as you. Where this becomes an issue is when you assess that your opponent doesn't have any open Mountain areas that they can do anything in, so you choose Brace Mountain Witch, so you can go to the adjacent mountain and deliver a potion. But your opponent has decided that even though they dont get to go first, once it becomes their turn, they are going to try to chain together a Plains and then go to the Mountain two spots away. Twice in a row, even though you clearly are trying to go to the adjacent mountains. And they act put out because you threw their chain off, so now they can't really go to the mountain they were trying to get to. Overall I really liked it, but the opponent's strategy stressed me out. He's a better strategist than I am, so he had to know I would be trying to get into the mountain, so he had to have been blocking me. But he got all flustered and didn't know what to do when mountain came up as early as it did. So either he was playing me, or he wasn't considering my move at all, which I highly doubt. For a kids-themed game, there was another layer of weird betrayal underneath it. I'd give the game another solid 7/10. We also player his copy of Sellswords , which is basically a mini game straight from Final Fantasy. 8/10 - Quick, replayable, fun, tricksy. Consists of two rounds with two parts each. First you lay out 12 heroes with special abilities and numbers on their each edge, you take turns collecting these heroes into your hand. Second part you lay the heroes out on the board. Every time you place a hero next to another hero, you compare the numbers on the edge. If the defending hero is an enemy, and they have a lower number than the new card, they are flipped and become part of your army, and so on, until the end, when you count points by how many of your army is in each row. The other was Lanterns The Harvest Festival from my collection, a tile laying, resource management game. 8/10, quick, replayable, fun. You draw three tiles and match colors, collect cards and buy honor. Pretty each to learn, and Fun, Kind of reminds me of Carcassonne, but Festive.